- Why should I get business energy quotes? Okay, so let’s start with the basics. Business energy is – well, energy for businesses. In the same way your home receives a supply of gas and electricity, so does a business – and it certainly wouldn’t get far without it! This guide will fill you in on everything you need to know about business energy – from explaining the different tariffs and meters, to prices, environmental schemes and everything in between. How much do business utilities cost? Do I qualify for reduced VAT? Is business energy cheaper than domestic energy? If you were to compare average unit rates for domestic and business energy, business rates would always be cheaper. In fact, as a general rule, the larger the business, the cheaper their unit rate. However, businesses are subjected to some charges that domestic customers are exempt from. For example, domestic customers pay only 5% VAT on top of their energy bills, whereas businesses pay 20%. Some businesses do qualify for a lower VAT rate – we’ll get into that later on. As well as additional VAT, businesses also have to pay the Climate Change Levy (CCL), which can bump up the cost of electricity by around half a penny per kWh and is set to increase dramatically next year. Who supplies business energy and which is the best supplier in the UK? After for a more in-depth review? We’ve looked beyond the Big Six in our guide to the best business energy suppliers. We compared 30 suppliers on price, customer services and eco-friendliness among other factors. It would be easy to assume that the Big Six are always able to offer the most competitive rates due to their sheer size. Over the last few years, there has been an influx of excellent independent suppliers that can offer your business both a great service and competitive rates. You can read more about each company and our review criteria here. Okay, let’s get down to the important stuff: money. This is an amount you pay to have gas or electricity supplied to your commercial property. It’s normally given as a daily rate. A kWh is relatively small ‘amount’ of energy – the amount required to sustain 1KW of energy for one hour. In real terms, that’s about the energy needed to power a laptop for two and a half hours. The ‘per kWh’ rate shows you how much you will pay for every unit you use. That’s why you should have an idea of how much energy your business uses in a year or month. It’s much easier to compare prices if you know this. So what does this actually mean for you? How much can you expect to pay for your annual business energy bills? It’s no surprise that the amount you pay depends greatly on the size of your business and how much energy you use. However, people often don’t realise that the bigger companies also tend to secure even lower rates for their energy. Smaller businesses have less experience and less bargaining power, so can often end up with the most unfair tariffs. Region can also be a factor. In fact, it’s believed that there could be a difference of as much 20% between the cheapest and most expensive regions. London-based companies, rejoice: your rent may be high, but your business energy costs are among the lowest in the country. It’s actually the more remote regions, such as the South West, northern Wales and northern Scotland, which generally have the highest rates. 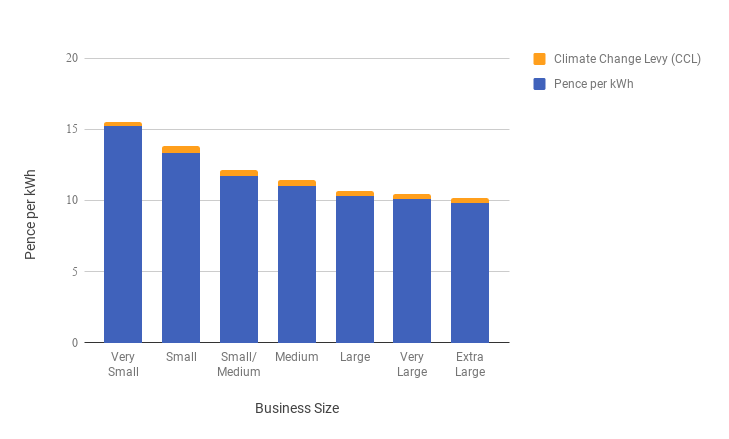 How much are utilities for a small business? Depending on the size and location of your business, you would expect to pay between £600 and £2,000 for electricity for a micro/small business, and around £600 for gas. You will also need to factor in the cost of water, which is likely to be the cheapest of the three. An energy broker helps businesses or individuals find better deals for their energy. They essentially act as a middle man between suppliers and customers, in the same way that a comparison site does. Partnering with an energy broker is very much a win-win situation. Businesses save lots of money on their bills, and all for no cost and minimum effort. Brokers have a very deep knowledge of the energy market, and build close relationships with suppliers, who may in turn offer them special rates. Expert Market work closely with Power Solutions, who are an established and very well-regarded energy broker. You can read all about how Power Solutions can help your business, or fill in this form to be put in touch with them. Is my business entitled to reduced VAT on its business energy? Your supplier should automatically apply the lower rate if you are entitled to it, but it’s worth flagging if you suspect you’re paying too much. See, we told you these would be quick wins! CFL and LED bulbs can reduce energy consumption by 75% and last up to three times as long. In times gone by, energy saving bulbs were synonymous with a harsh, clinical white light, but they’ve come a long way since then. Again, really basic but highly effective. Reminding staff to shut down computers, turn off coffee and vending machines, and switch off lights and aircon is a quick way to minimise waste. Now you have your lovely efficient new light bulbs, it’s time to take things one step further: motion detectors. Install these in meeting rooms and toilets, which are both areas likely to be vacant for longer periods of time. Motion sensored lights cost around £20 – £50 each, plus a little more to have them installed. Depending on the machine, printing a double side of A4 uses around 0.04 kWh of energy. That might not sound like much in isolation, but it quickly adds up if lots of people are printing several pages a day. Try to develop processes that rely as little on printing physical pages as possible. Not only will you save money on your energy bills, but you will also spend less on toner and paper, and reduce your impact on the environment. Calling this a ‘quick’ win may be a bit of a stretch, but allowing employees to work from home for a day or two per week will reduce your overheads dramatically. What’s more, there are a wealth of case studies indicating that working from home can have a positive uplift on productivity. With instant messaging services such as Slack, there’s really no reason that someone working from home should be any more difficult to contact. Business environmental schemes might not sound particularly glamorous, but these schemes might help you save thousands – we bet you’re interested now! The Renewable Heat Incentive incentivises businesses to generate their own gas to make and save money. Using this scheme, businesses are encouraged to find renewable ways to generate their heat in exchange for financial rewards. Options include: biomass boilers, ground to water heat pumps and solar thermal panels. The amount you can earn depends on your usage and the technology installed. You can find more information and check your eligibility on the Ofgem website. The Feed in Tariff was designed to incentivise businesses and households to generate their own electricity where possible. The hope was that this would ease pressure from the National Grid, as well as moving the UK towards its sustainability goals. In short, the Feed in tariff enabled businesses that use solar panels, wind turbines etc. to generate their own power for free and earn money by selling any excess back to the grid. As of 1 April 2019, the Feed in Tariff is closed to new applications. Importantly, though, this won’t affect businesses that are already taking part in the scheme. So don’t worry if you are – you’ll continue to benefit from it (FIT support is payable for 20 years – or 25, in some cases – and tariffs are adjusted annually by RPI). If you wanted to take part and have submitted an application in advance of 1 April, your application will still be considered, and you might still be approved to join the scheme as normal. If your business is energy intensive and you have entered into a Climate Change Agreement (CCA) with the Environment Agency, then you can pay a reduced CCL rate. There are other circumstances under which your business may be eligible for exemption or a reduced CCL rate. It’s worth reading up on the full government guidelines on this. You will automatically be charged for CCL, and the charges will be listed on your bill. Schemes like the Feed in Tariff and the Renewable Heat Incentive have provided great support systems for small-scale renewable energy generation. However, larger-scale projects need financial support too, and that’s where the Renewables Obligation comes in. It basically places an obligation on suppliers to get a certain amount of their energy from renewable sources. The scheme is in the process of being phased out, and is being replaced by the levy known as Contracts for Difference (CfDs) – see below. Contracts for Difference is a levy that is paid by business electricity consumers. It basically ensures that renewable sources of energy remain financially viable. First, a ‘floor price’ is set. This is the cheapest price that renewable electricity can be sold at without making a loss. If the market price falls below this, a compensatory payment is made to the equivalent of the difference between the market price and the floor price. This ensures energy companies are still able to use these greener methods, rather than resorting to cheaper generation alternatives, such as coal and gas. This cost is passed to business customers through the rate they pay for their electricity, so there is no additional cost to worry about, it’s just good to be aware of. The CRC efficiency scheme was introduced by the government to try to reduce inefficiency and carbon dioxide emissions. Businesses that qualify for the scheme are required to register for it, or they could face a hefty fine. Once registered, businesses are required to monitor and report on their CO2 emissions from gas and electricity use. The Environment Agency then calculates how carbon they have effectively produced. The organisations then have to buy ‘allowances’ for each tonne they produce. It’s worth reading up about the scheme and it’s qualifying factors if you think you should be registered. You may well be unsure what kind of electricity meter your business has. After all, it can’t make that much difference, can it? Businesses on single-rate meters will pay a single unit price for their electricity, no matter the day or time. This type of meter is most suited to businesses operating fairly traditional working hours. Most meters of this type will be ‘standard meters’, but businesses with a higher demand may have a ‘maximum demand meter (one rate)’. With a two-rate meter, your business pays two different unit prices for electricity. This is a great option for businesses that use a lot of electricity between around 12am and 8am, such as takeaways or bakeries. The simplest type of two-rate meters are Economy 7 and Economy 10, offering seven and ten off-peak hours at a cheaper rate respectively. The exact hours will vary by region, and you should check with your supplier. With an ‘Evening and Weekend’ meter, the unit price varies by day as well as by the hour. With these meters, you pay a cheaper evening/weekend rate, and a more expensive weekday/daytime rate. 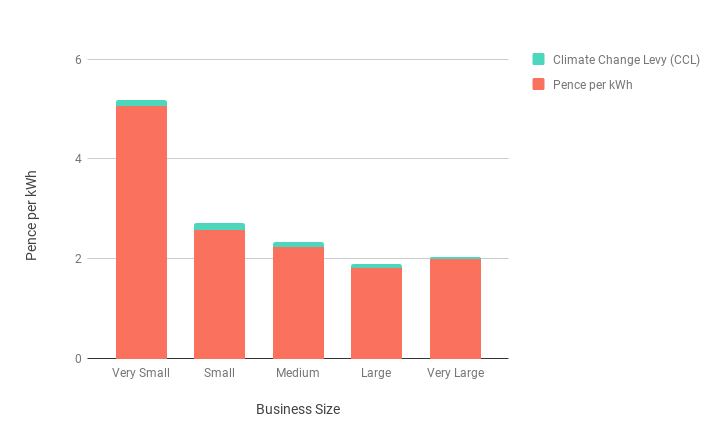 Again, there is a ‘maximum demand meter (two-rate)’ for businesses with particularly high demand. A three-rate meter is ideal for businesses that use most of their electricity at night and on the weekend, such as a nightclub. These meters have three rates, the cheapest being weekend/evening and the most expensive being weekday/daytime. They are also known as ‘Evening, Weekend and Night’ meters. A Seasonal Time of the Day (SToD) meter is the most complex of all. With this meter, businesses pay a different unit price depending on the time of year, day and time of day. These are best suited to businesses that have seasonal periods of very high demand. If your business’ supply number starts with ‘00’, you already have a half hourly meter installed. Half hourly meters use smart technology to report on business energy consumption. They are the simple equivalents of the more sophisticated ‘smart meters’ that are becoming increasingly common in UK homes. Half hourly meters automatically read your meter every half hour and feed this information back to your supplier. The benefit of this is that you have more accurate information about exactly what you are using and when, which in turn can help you get more accurate quotes from different providers. Using a half hourly meter also alerts you as to when you use the most electricity. With this information, you may decide that it makes more sense to switch to a two-rate or even a multiple-rate meter. The plan is for all businesses to have a half hourly meter installed by the year 2020. The technology behind them is still evolving, and the hope is that they will soon be phased out by more sophisticated versions. The new wave of smart meters will be as user-friendly as the domestic ones that are already in use. With a fixed tariff, businesses pay an agreed rate for their energy over a fixed period of time. Contracts with fixed tariffs are typically a year or more, and are often the cheapest option. Agreeing to a fixed tariff, however, does mean that you will run into difficulties if you decide to cut your contract short. At best, you will pay a hefty termination fee, and at worst you simply won’t be allowed an early exit. In fact, most business energy contracts will only let you give notice of termination within a very specific period – usually 3-6 months before your contract ends. If you don’t terminate your existing contract or negotiate a new one, you will often be automatically rolled over to a new contract with the same provider. If this happens, you’ll often be landed with an unfavourable rate, too. With a variable tariff, you pay for exactly what you’ve used each month. Sounds perfect, right? Wrong! As the saying goes, if it sounds too good to be true then it probably is, and variable tariffs are no exception. Yes, you will only pay for exactly what you use, but the rate you pay is typically much higher. What’s more, you are not protected from market fluctuations in price. The only reason a business should consider a variable tariff is if they are unsure of how long they will need the supply for, and so don’t want to commit to a fixed contract. While the majority of businesses have fixed tariffs, flexible tariffs are another valuable option. Peak usage – any random spikes in demand outside of typical usage. The business then purchases ‘blocks’ of each type of energy in bulk, and can sell any they don’t use back to the grid. While this can work really well for some, smaller businesses may find that the benefits are incremental to the effort involved in planning and buying the energy they need. Some business energy suppliers, such as Bulb and Ecotricity, only supply electricity that is generated with renewable methods. Supplying renewable energy is definitely a trend among new, independent suppliers. The majority of providers still rely heavily on electricity produced using coal, gas and nuclear power. Some of these suppliers do, however, offer the chance for customers to upgrade to a ‘green tariff’. This means the electricity they receive is generated either completely or mostly by renewable means. Though, of course, this comes at an extra cost. If you’ve moved into a new business premises and have started to use energy without first agreeing a contract with a supplier, you will be paying their ‘deemed contract’ rates. This is also the case if you terminate your contract but continue to use energy (although in this case it is sometimes called a ‘default tariff’). Deemed contract rates are significantly higher than all other contracts. This is why it is so important that you compare quotes and arrange a contract as soon as you move into a property, and don’t terminate your contract without making other arrangements. According to Ofgem, 10% of UK microbusinesses are currently paying deemed contract rates. This means they could be paying 80% too much for their energy. 1. How long does switching business energy supplier take? If you are out of contract, switching business energy suppliers shouldn’t take any longer than switching household suppliers. You can agree a specific day to make the change with your new and old suppliers. You then just need to take a final meter reading on this day. 2. Will my business supply be disrupted if I switch suppliers? Lots of businesses put off changing suppliers because they are concerned that they will be left without either gas or electricity while the switch is made. Losing power is a business’ worst nightmare, so we are pleased to dispel this common myth once and for all. Your business will never be left without energy as a result of switching suppliers as they all share the same cables and infrastructure, so don’t let this hold you back! 3. What is a Letter of Authority? If you choose to partner with an energy broker when looking for a new supplier, you will need to fill in a Letter of Authority. This is a document to confirm that you are happy for the broker to liaise with suppliers on your behalf. They will provide you with the blank letter to complete and sign. 4. How can I complain about my business energy supplier? If you have an issue with your business energy provider, your first port of call should be the company’s own complaints procedure. You’d be surprised at how many complaints can be resolved this way both quickly and efficiently. Companies make mistakes, and are generally quick to hold their hands up and admit as such. However, if you find yourself unable to reach a mutual resolve in this way, you can contact the Energy Ombudsman. If your complaint is with one of the Big Six (ie. British Gas, EDF, e.ON, nPower, Scottish Power or SSE), you can take your issue to the Ombudsman eight weeks after lodging your complaint through their own system. If you’re with any other provider, this can be done after 12 weeks. Congratulations! You’re now a business energy pro. Now you understand how business energy works, it’s time to check out the best suppliers for the job. We’ve rated them by cheapest, greenest, best customer service… you name it, we’ve done it. Or you can skip straight to the good stuff and compare quotes from trusted suppliers. Why should I get business energy quotes?